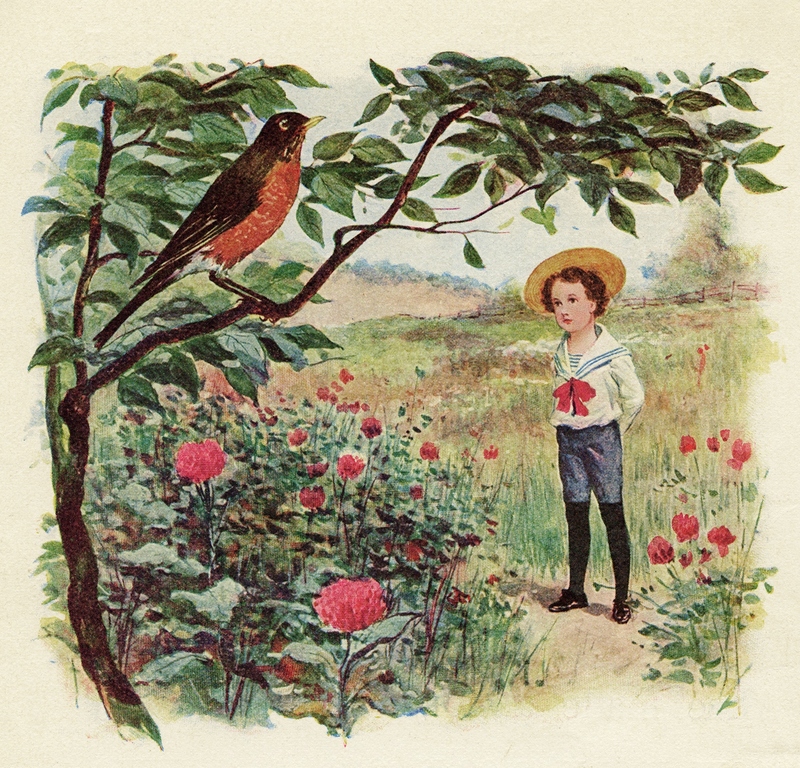 A detail from Child Life, A First Reader, by Etta Austin Blaisdell and Mary Frances Blaisdell, 1902, courtesy of the Old Design Shop. I proceed on the outside with my daily life, all the while taking mental or handwritten notes. These observations saved ‘for writing’ often echo personal revelations. The regularity of this continues to astound me, especially as I re-post poems from this blog’s archive. It is sometimes said among writers that we are called to write what we are called to learn. Today’s archive treasure is “a small heart panics.” It is a companion piece to “String.” In the former poem, the birds flit from the speaker in fear. In the latter, the birds in the wood are settled and stable, but here the speaker’s presence is not human. The speaker has transformed into a balloon, which is less threatening to the squirrels and wood pigeons. “A small heart panics” reminds me of my own jittery flight when someone veers too far off the path to say hello. I am cautious and prone to wall myself off against vulnerability. I also know that this poem originates from a walk in the wood when I tried to befriend some birds and did indeed see myself in them. Similarly, with my author’s knowledge that “String” resonates with one singular moment of comfort, I can measure how these poems inform and complement each other. When writers are called to write what they need to learn, this need not be biographical or psycho-emotional. In some instances we are called to write in different styles (e.g. an annual report) or for unexpected purposes (e.g. an explanation of an alarm system). On occasion, I have been required to write about topics for which I could muster very little interest (a narrative report of a workshop comes to mind). Yet through these processes I have learnt about style, brevity, research and working with an editorial team. You write what you need to learn. You often teach what you need to learn. In sharing the work and self-aware process, you expose yourself twice over. The passersby will not only proffer hellos, but indignance and criticism. In such a state of vulnerability, your forest birds will no doubt become wary. Mine do.